Evergreen trees and shrubs are popular anchors for many North American yards. The average consumer thinking about purchasing one might ask, What’s the best information to have in hand when making a decision? Start with some basic clarifications and the choice becomes less complicated. First, what type of pine trees might the consumer be interested in? Consumer related discussions commonly use both formal and informal language. For example, the term pine tree can refer to either all trees in the pine family (pinaceae), or to the one hundred plus trees in the genus Pinus. While botanists classify types of pine trees based on strict physiological criteria, a lay person’s less comprehensive approach, provides a quick way to organize an answer to your basic what type of pine tree is this question. Most consumers recognize Pinus species by their common names such as Scots Pine, Jack Pine, Red Pine and Stone Pine. Because most pine tree species grow in specific areas, any particular area usually only hosts a few of the total one hundred plus pinus species. Consumers can easily discover the dominant pine in their region by consulting with a local extension service. The second question of interest to most consumers is how large the tree will grow. Available space structures many consumer tree buying decisions, and again, local tree nurseries often breed small, medium and large varieties of many popular trees. 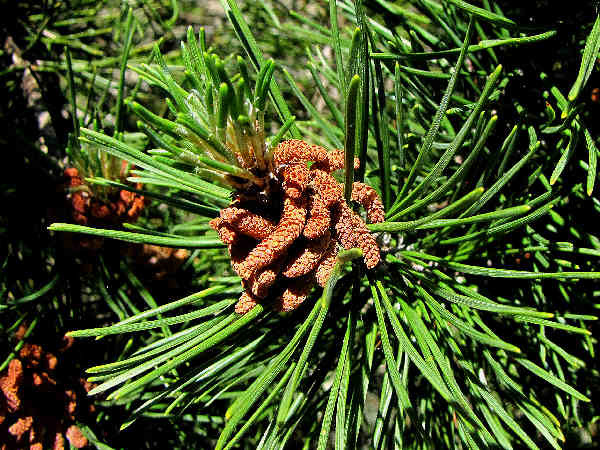 Identifying any of the handful of pines native to an area can be as easy as examining the tree’s needles and matching them with the local species. With few exceptions, pine tree needles grow in pairs of two, three and five, giving rise to the common phrases two-needle pines, three-needle pines and five-needle pines. Many pine trees referred to as the true pines grow large and consumers interested in anchoring their yard around a standard pine might also want to look at some commerical varieties bred for limited height. In some areas, smaller pines are often available for the yard. Shore Pine (Pinus contorta contorta), a two-needle pine, grows on many types of soils along the Pacific Northwest coastal areas. The trees grow in a somewhat irregular pattern, often smaller and wider than the typical tall and thin pine tree shape. Their adaptability makes them a popular landscaping tree. The picture shows a cone surrounded by the two needle bundles on the branches. Two conifer families, pines (pinaceae) and cypress (cupressaceae), dominate the North American Landscape, with names such as larch, cedar, spruce and pine almost universally recognized. The picture shows foilage from a Western Red Cedar, a common cypress family member. 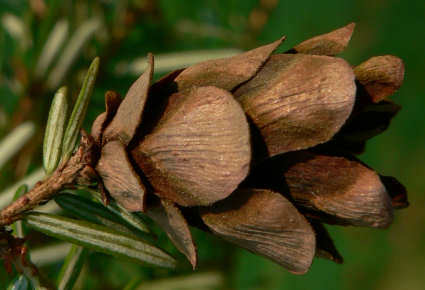 Discussion of the types of pine cones that come part and parcel with any conifer purchased typically focus on shape and size. 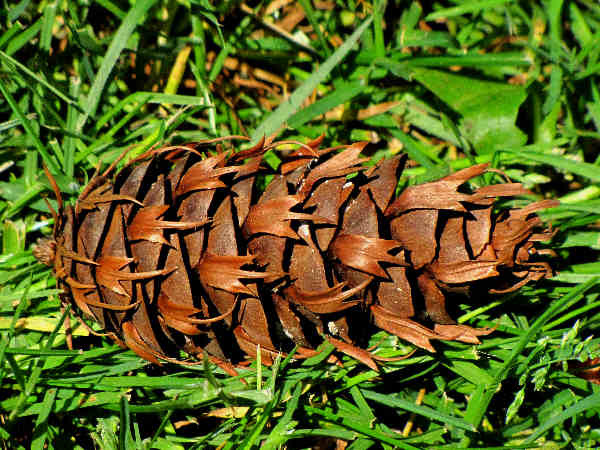 Loosening the definition of pine cone to the less formal starting place of any seed bearing cone found on any trees in the larger Pinales order (Coniferales) allows for pine cone discussions to refer to two conifer families, pines (pinaceae) and cypress (cupressaceae). Both conifers dominate the North American Landscape, with names such as larch, cedar, spruce and pine almost universally recognized. Their cones vary in size and shape. Starting with pine trees in the formal pine genera (pinaceae) no discussion of pine trees and pine cones is complete without mention of the White Pine. These are large growing trees characterized by needles growing in groups of five. The Eastern White-Pine, eastern North America’s tallest growing tree, gets overshadowed by the Sugar Pine, the western North American version, and the world’s tallest growing pine tree. Additionally, White Pines also produce the world’s largest pine cones. 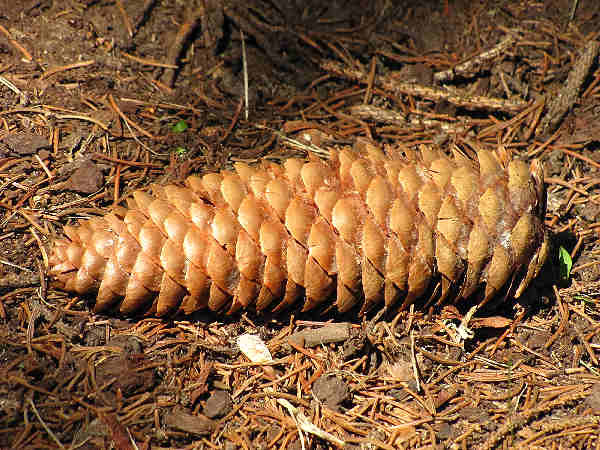 The Sugar Pine, for example, can produce cones reaching two feet in length. The picture show a cone with thin papery scales of a spruce cone. 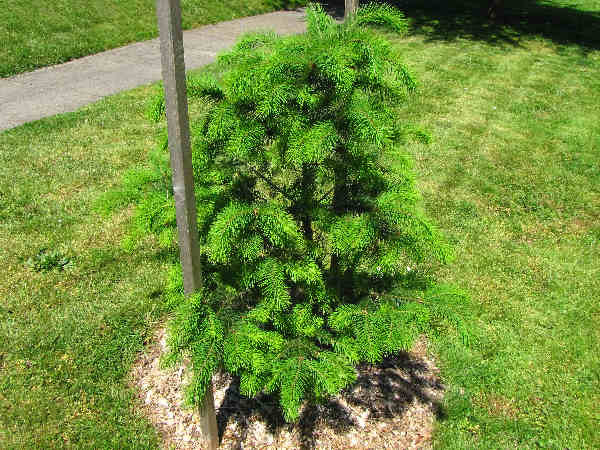 When it comes to landscaping choices, spruce trees are very popular anchor evergreen tree in yards from coast to coast. Thinking of a an evergreen tree anchor with a state identity? Consider the Pacific Northwest alternatives. 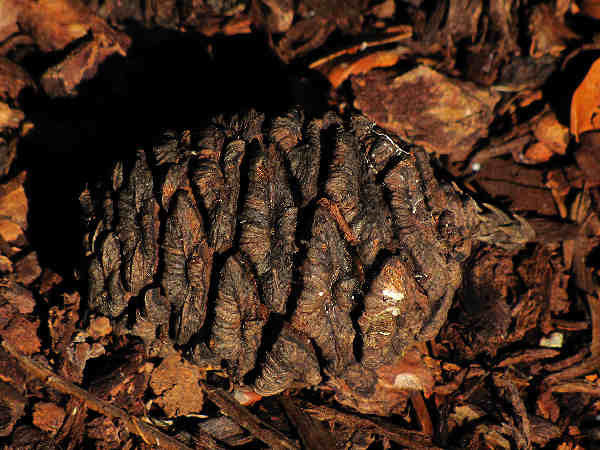 Picture five shows a Douglas Fir cone, a predominantly Western pine genus (Pseudotsuga). Second only to the coastal redwood (Sequoia sempervirens) in size, Douglas Firs can reach heights of three hundred feet or more. The three-pronged bracts that cover the sides of the cone, give it a distinct look and make it one of the easiest cones to identify. Douglas Firs are the state tree of Oregon. Nothing says tree like the Giant Sequoia (Sequoiadendron giganteum). Pound for pound they rank as the world’s largest tree. According to the National Park Service the General Sherman Tree in Sequoia National Park is the largest (by volume) tree in the world. It’s a very popular tourist destination. Homeowners will be interested to know that they are adaptable to a variety of climates, so growing one in the back yard is not an impossible task. They need a good deal of water and patience. It will take a hundred years or so for anyone in the family to see them as a massive tree. Formally speaking, Sequoias are related to the Coastal Redwoods and Cyprus trees in the family Cupressaceae. The cones are relatively small. Five different Hemlock species (Tsuga) grow in North America. 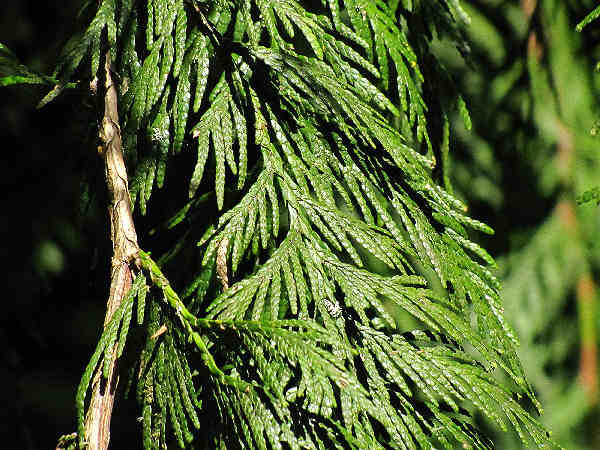 Western Hemlock (Tsuga heterophylla), the tallest species, grows up to two hundred feet in height, in its moisture rich Pacific Northwest coastal environment. Like the Giant Sequoia, the Western Hemlock demonstrates the big is not always better cone concept. Picture six shows a cone, measuring around one inch, enlarged by a factor of three. The small, soft needles, have white stripes on the back. The Western Hemlock is the state tree of Washington State.